Necessity is truly the mother of invention. A day off from work and I was all set to get up and make a mess of truffled scrambled eggs (my new addiction...got some wonderful truffle salt for Christmas from a coworker, and I've been putting it on everything. It does things to scrambled eggs that should be illegal). However, my overstuffed fridge somehow only yielded two eggs. Woe. On top of the fridge, however, was a stash of pancake mix. I know I keep saying I'm not a mix person, and I'm not - but pancake mix is actually some pretty useful stuff (mixed with beer it makes a killer deep fry batter), so we do usually have some around. So I decided on lazy woman's blueberry-pecan waffles...only to find I didn't have any blueberries either. Back to woe. I did, however, have many cans of pumpkin. (I keep meaning to try my hand at pumpkin creme brulee, but things like work and life keep getting in the way.) I've made pumpkin waffles before - basically by substituting pumpkin for water , same way I make eggnog waffles. (Like I said, we always have some mix around). Last time, though, they were a wee bit heavy, and I wanted to try and lighten them up but not lose that delicious pumpkin flavor. In my fridge exploration I also found some buttermilk I needed to use up, and figured that was the little sumthin-sumthin my waffles might be looking for. Score. Light, fluffy, pumpkiny, spicy - just what I wanted. Relaxing breakfast in pj's achieved. Mix ingredients well with a whisk, and cook in a waffle maker according to the manufacturer's directions. 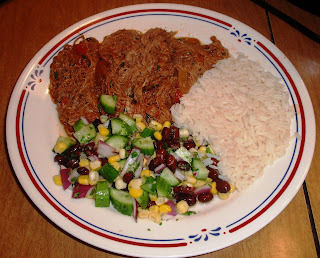 I have to admit, I'm sort of a sucker for a dish with a fun name...and Ropa Vieja is just fun. The name means "old clothes" in Spanish, so called because the shredded beef looks like rags of old clothes. This definitely doesn't taste like old clothes, though - it is a delicious beef in a tomato based sauce. Sort of like pulled pork, but a different flavor profile. Ropa Vieja is one of the national dishes of Cuba, but it actually originated in the Canary Islands. These Spanish islands were a major stopover for ships sailing from Spain to the New World, so it makes sense that some of the cuisine would have made its way over as well. I first made this dish many, many years ago, when I was given The Frugal Gourmet's "Our Immigrant Ancestors: Recipes You Should Have Gotten from Your Grandmother" cookbook. This was before all that terrible stuff came out about him...so sad, that. But the book is still pretty cool, and was a great introduction to all sorts of cuisines that I had never even thought about. I hadn't made it in ages, but decided it was due for an upgrade - and I had a hunch it would translate well to the slow cooker. Good hunch ! 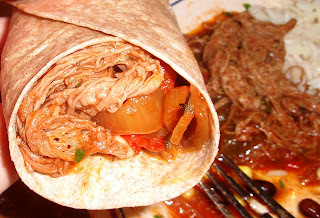 Ropa Vieja can be served in all kinds of ways - over rice, beans, or mashed yucca; rolled in tortillas; or just all by its own lovely self. We decided to go with rice and Auntie Jojo's Black Bean Salad, with tortillas on the side...just perfect ! I'll take old clothes like this any day !! Brown the meat in an oiled pan, and place in the bottom of the slow cooker (you don't want to cook the meat - just get a nice sear on it). Scatter the onion, peppers, jalapeno, and garlic over the meat. Combine the remaining ingredients (except the cilantro) and pour over the meat. Cook on HIGH 4-5 hours or LOW 8-10 hours. Shred the meat right in the crockpot (two large forks work well), mix with the sauce, and garnish with the cilantro before serving.